Lone Star Muscle Cars Is Proud to Present This Super Rare And Low Production Color Corvette. This Corvette was used by the Indy 500 Festival Committee in May 1990. Chevrolet could not provide ragtops for the festivities so 30 yellow and 30 turquoise Corvette convertibles were provided. This Car is Also A Low Production Number Due To The Fact GM Was Having Trouble With The Code 53 Competition Yellow Color it was discontinued on 5-11-1990 due to pigment photosensitivity it would make the paint get darker exposed to sunlight. So Here We Have A double rare Corvette A INDY Festival Car And one of only 278 Competition Yellows Produced For the 1990 Build. This Car even has the INDY Registration still with her a cool thing to have. Now Every One Loves To Show Off There Corvette And This One Has Some Special Touches To Do Just That. The Interior has been enhanced with some yellow trim and custom seat embroider to give this vette that one of a kind look. On The exterior you will notice the Indy Graphics and more. 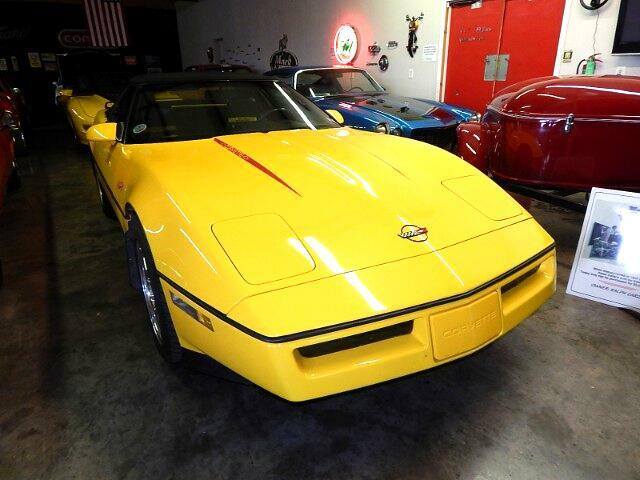 This Corvette has been very well maintained and cared for. When You go to a Corvette event this car will stand out in the crowd. Powered By The All Famous V-8 Motor And Automatic Transmission All The Power Goodies You Will Find In A 90's Model. Call Today For More Information or Stop By And Check Her Out In Person. Message: Thought you might be interested in this 1990 Chevrolet Corvette.